First, preheat the oven to a toasty 350° Fahrenheit and grease or butter up the muffin tin. 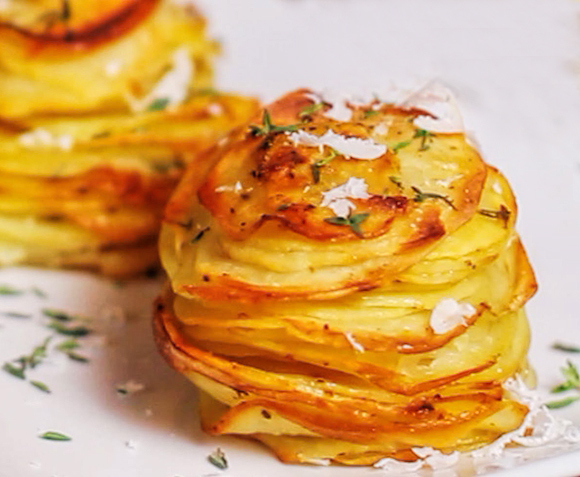 Place all the potato slices in a large bowl and pour the melted butter, Parmesan cheese, garlic powder, thyme, and salt and pepper. Mix them all together so that everything is nice and evenly coated. Take the buttery slices and place them into the muffin cups, making sure to stack and layer them as you go. Pop the muffin tin in the oven and bake for approximately 55-60 minutes. They’ll be done when the top and edges turn golden brown. They will be super hot, so after you remove them; allow them to sit and cool for at least a couple of minutes before serving and if you’d like, sprinkle a bit more salt and pepper or Parmesan cheese on top. If you don’t like thyme feel free to use any other herbs you prefer like rosemary, oregano or basil.